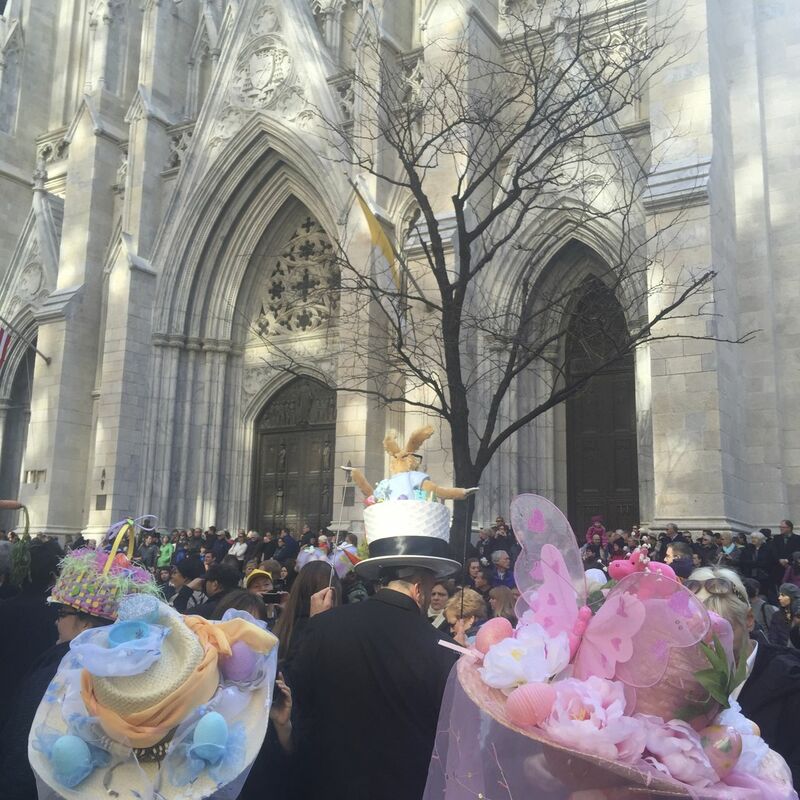 An updated calendar for annual spring events in New York City for 2019. 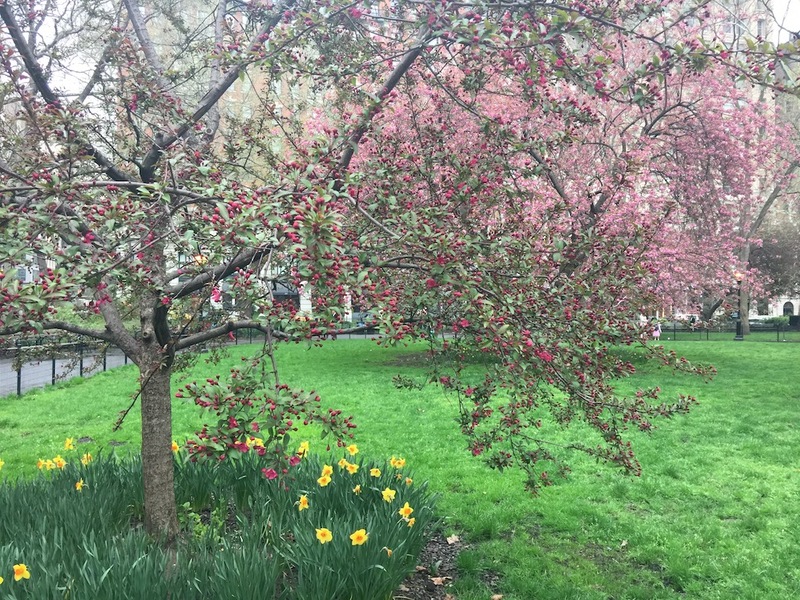 Let's spring forward to blooming times in New York City, the best locations for witnessing spring's beginnings, and springtime events. While the occasional snow could blow through the city, we're just weeks now from callery pears in bloom and opening day at the ballpark. 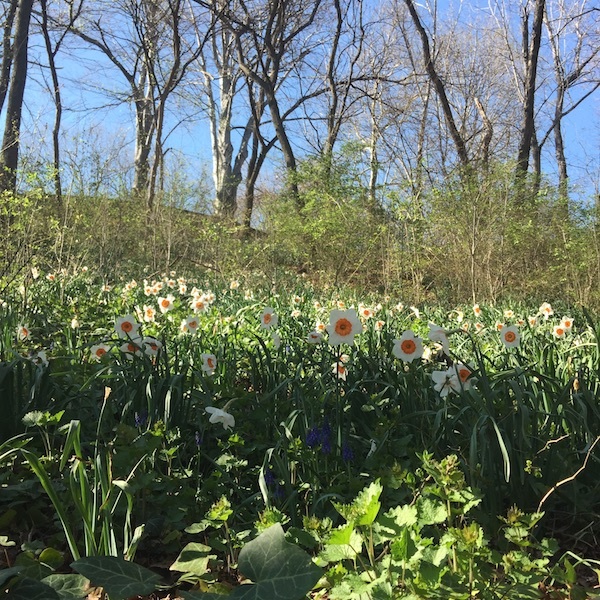 • Central Park Conservancy's website lists blooming times within the park. During the month of March we begin to see crocus, daffodils, forsythia, snowdrops, witch-hazel, and hellebores. Species tulips will emerge in several places, but the Shakespeare Garden and Conservatory Garden are particularly good places to catch the beginning of spring blooms. Central Park near E. 72nd St., saucer magnolia, typically end of March. April is usually the month when full blooms appear in New York City, and this NYC Parks website provides a handy monthly guide to the specific locations of blooming trees, flowers, shrubs, and buds. Celebrating the great beautiful flowering crabapples, this page on the NYC Parks site explains why you can't buy and plant a crabapple today and expect it to look as beautiful as those in Central Park. 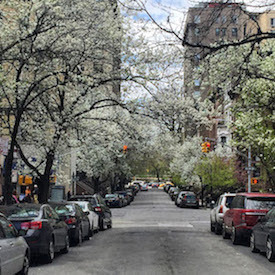 • By late March or the first week of April, the callery pears should be in bloom, providing a soft white canopy on many New York streets. These trees can withstand urban pollution, but storms can wreak havoc on them. • Check out The Orchid Show, a special presentation of a dazzling collection of orchids brought to you by The New York Botanical Garden in the Enid A. Haupt Conservatory. Bronx River Parkway at Fordham Road Bronx. The special show continues through April 28, 2019. Spring in Madison Square Park. 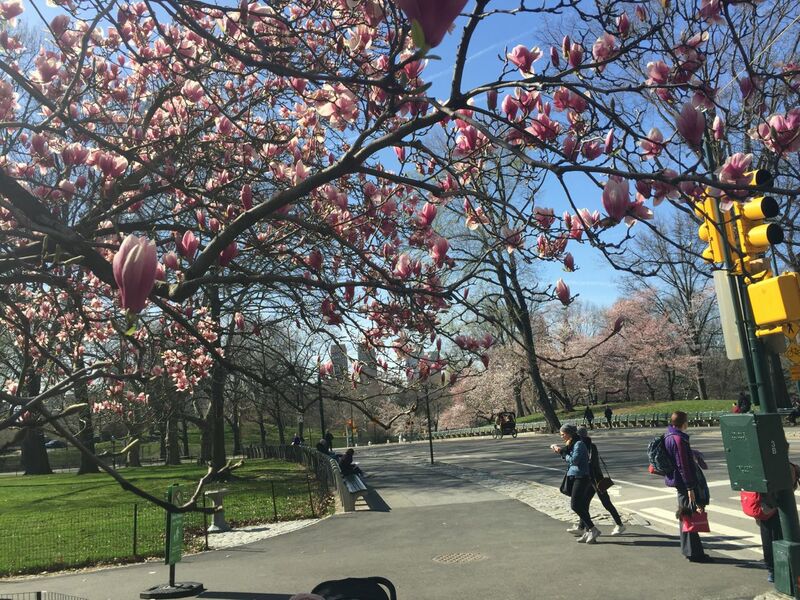 Late April and early May are the best times to see the flowering trees in NYC. • Walking Off the Big Apple's favorite annual spring walk is wandering in The Ramble in Central Park. 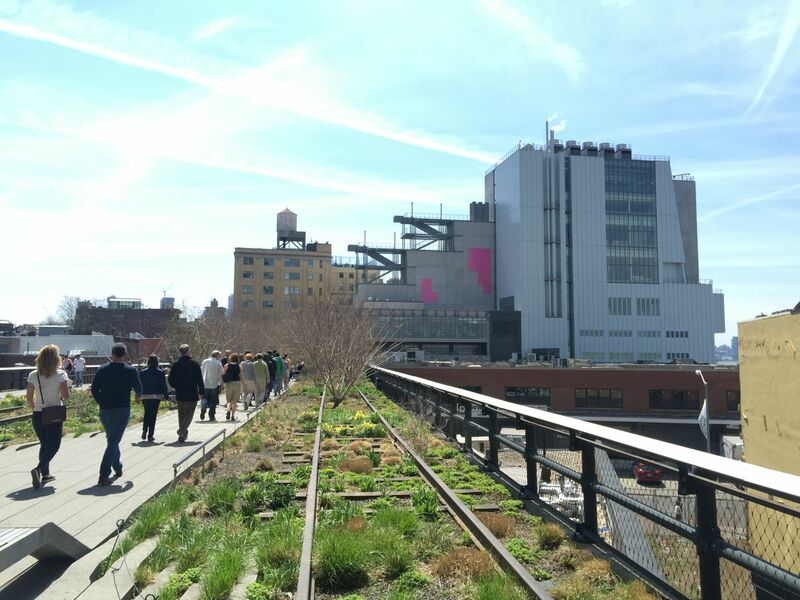 • The High Line features plantings around the seasons. • Million TreesNYC. 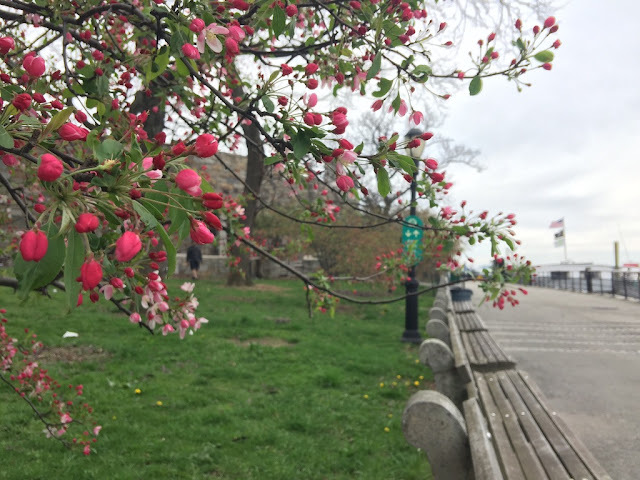 See how you can help this citywide, public-private program to plant and care for one million new trees across the City's five boroughs over the next decade. 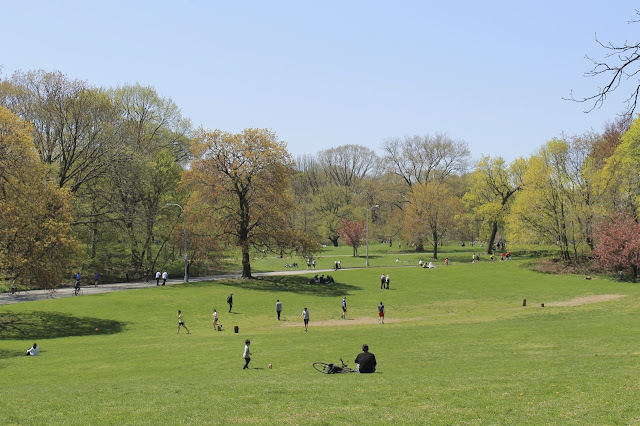 • Visit the Prospect Park Alliance website for interactive guides to the park, seasonal events, and more. When visiting in person, locate the park's Audubon Center for a quick orientation. American Museum of Natural History. Mid-late April. • While many of the city's parks sponsor events for the season, Fort Tryon Park in Upper Manhattan offers particularly good fitness opportunities in a spectacular setting. Consult the Fort Tryon Park Trust website for more information. • While in Fort Tryon Park, visit The Cloisters. 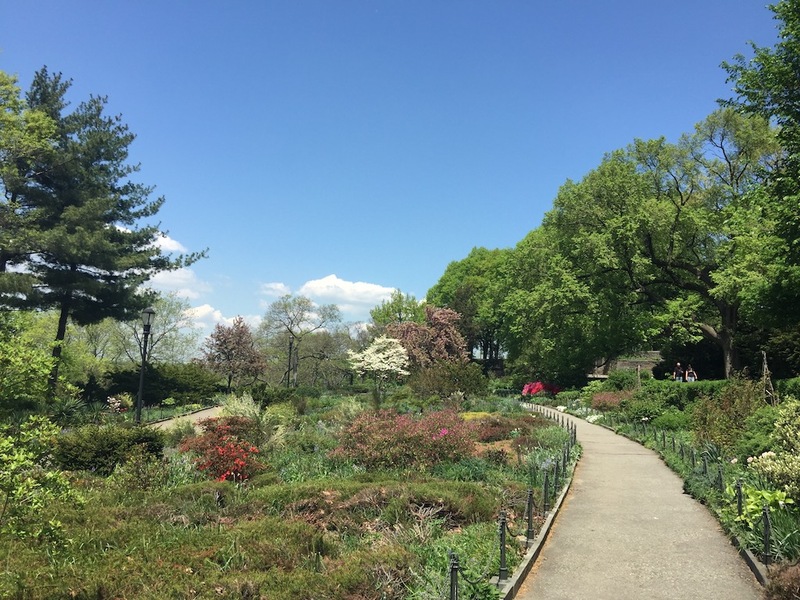 The Metropolitan Museum of Art's medieval branch is one of the best places to see varieties of plants in bloom. • For those seeking to understand the ecology of the city's landscapes, explore the Wildlife Conservation Society's Welikia project, the city-wide expansion of their popular Mannahatta. • According to the Victory Seeds website, the average last frost in New York City is April 13. • Try forest bathing in Central Park. Or locating the past in Riverside Park. Sakura Park, too, is pretty in cherry blossom time. • Saturday, March 16, 2019 St. Patrick's Day Parade. Fifth Avenue, from 44th to 79th Streets. Consult this St. Patrick's Day post that includes Walking Off the Big Apple's awesome bar and parade map, plus bonus Judy Garland song. • March 24 -April 7, 2019. Macy's Flower Show. Website. • March 28, 2019. Home opener. Orioles at New York Yankees. 1:05 p.m. Yankee Stadium, Bronx. Official site. • March 28-31, 2019. Affordable Art Fair. Metropolitan Pavilion. Website. • April 2, 2019. NYC Ferry Spring schedule goes into effect. Plan your commute (official site.) See Sailing Off the Big Apple's post for more information about how to ride the ferry. • April 4, 2019 at 1:10 p.m. Home opener. Nationals at New York Mets. Citi Field, Flushing, Queens. Official site. • April 4-7, 2019. The Photography Show. AIPAD. Pier 94. Website. • April 6, 2019. 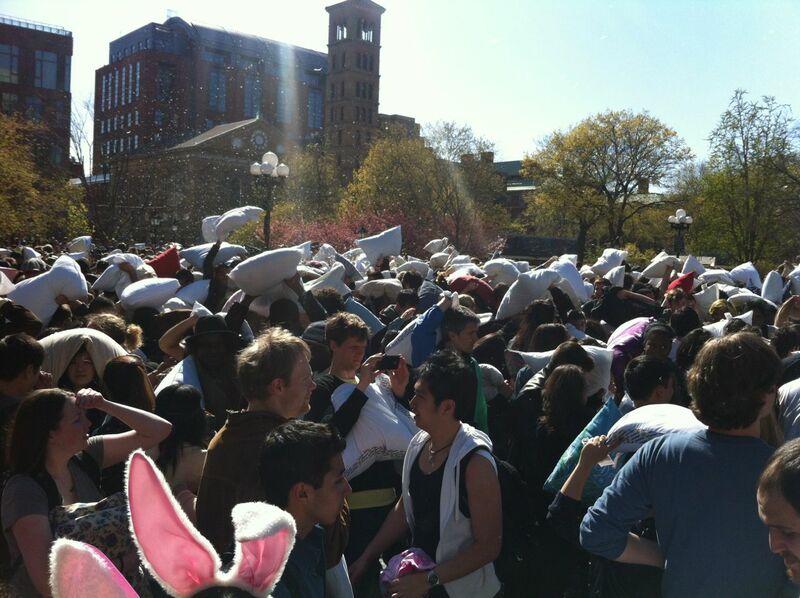 Pillow Fight Day. 3 p.m. Location TBA. 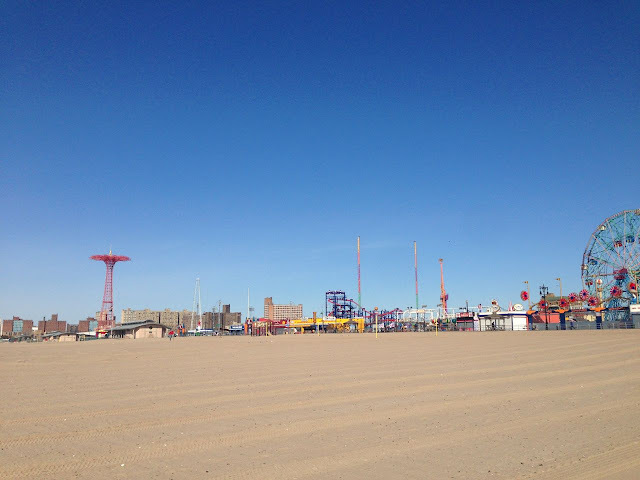 Coney Island attractions open April 6, 2019. • Sunday, April 14, 2019. 1 pm. Greek Independence Day Parade. Fifth Avenue. 64th to 79th Streets. • April 19 - 28, 2019. New York International Auto Show. Jacob Javits Center. • April 24 - May 5, 2019. Tribeca Film Festival. Some of the special events take place outdoors. Cherry blossoms on display at the Metropolitan Museum of Art, Fifth Avenue. • Sunday, April 21, 2019. Easter Parade. Fifth Avenue, beginning near St. Patrick's Cathedral. 10 a.m. to 4 p.m. 49th to 57th Streets. • April 27 - April 28, 2019. 10 am - 6 pm, Brooklyn Botanic Garden. Japanese Cherry Blossom Festival - Sakura Matsuri 10 a.m. - 6 p.m. Rain or shine. Free with admission. Celebration of Japanese culture and the blossoming of the garden's cherry trees. Also, consult the garden's Cherry Blossom Status Map for opportunities to visit. • May 22-28, 2019 #FleetWeekNYC (website with events): Parade of Ships May 22 10 a.m. - 1 p.m. NY Harbor to George Washington Bridge. See related story for uptown viewing. Memorial Day weekend kicks off the summer season. Isham Park in Northern Manhattan. Mid-April. • Sunday, April 14, 2019. Palm Sunday, beginning of Holy Week. • Passover begins at sundown on April 19, 2019 and continues for 7 days until April 27, 2018. • Easter Sunday falls on Sunday, April 21, 2019. • The National Weather Service can and does predict the weather, issuing long-range maps and outlooks for the months ahead. Their monthly and seasonal color maps for the upcoming months indicates that New York City will see above average temperatures, not just for spring but for the rest of the year. • Several good blogs and websites keep track of the city's animal life. Among them - Urban Hawks is especially observant of the adventures of our red-tailed hawks; The City Birder is a good source of information for birdwatching in the big city. Follow the continuing adventures of the hawks in Washington Square Park and other areas with Roger Paw. A Baltimore Oriole visits Inwood Hill Park in early May. • New York City Birding: See the home page of NYC Audubon for events, trips, classes, and programs. 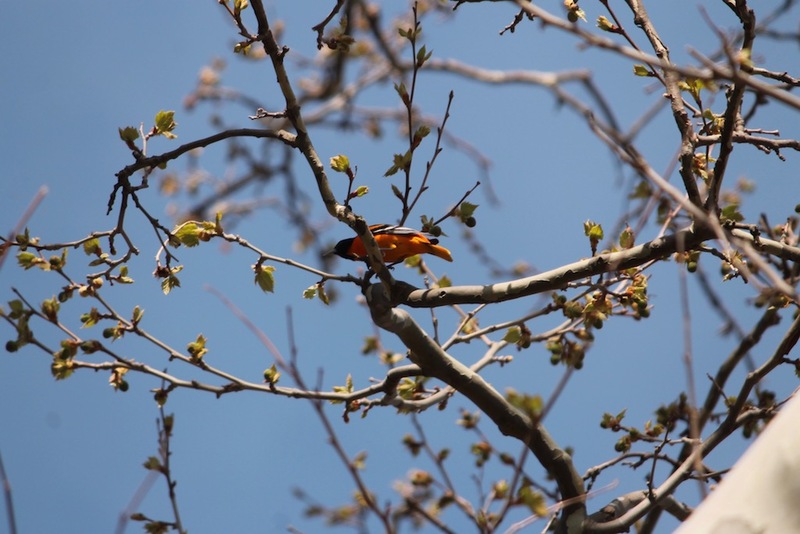 Also learn about Birding in Central Park on the Central Park Conservancy website. On Twitter, follow Manhattan Bird Alert for regular updates. Images by Walking Off the Big Apple. Clicking on the pictures above enlarges them.